This beautiful artwork features a fairy standing atop a building. The pixie wears a form-fitting black dress, with a cloak of blue sky. 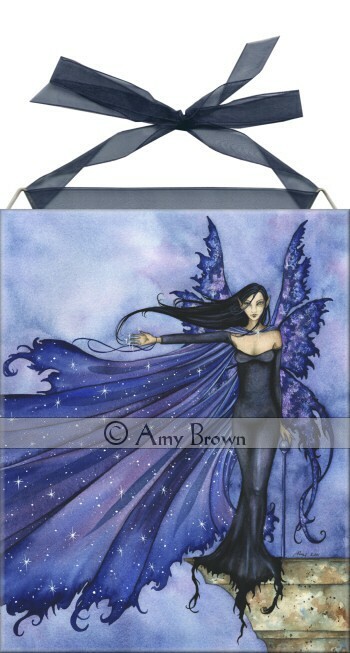 Stars shine from the shimmering fabric, and the fae's butterfly wings match in shades of indigo. 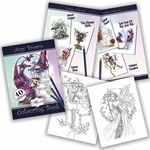 This item features the fairy art work of Amy Brown. It is an 8" X 10" ceramic tile with a full cork backing and two recessed hangars that fold flat for countertop use. A beautiful gossamer ribbon is included for hanging.